The SEND reforms are failing to meet the needs of autistic children, according to a new report from the National Autistic Society. The report, written by Catriona Moore, says far too many parents of the 120,000 children on the autism spectrum in England are facing long and often exhausting battles to get the right education and support. Two years after the changes came into effect, parents say that they are having to fight just as hard and often not getting the right support from local authorities and the NHS. And, I have to say, it’s not just children with autism, but children across the spectrum of disability whose parents have found the new system more, not less adversarial. The NAS surveyed around 1,000 parents, career, children and young people on the autism spectrum. The findings were not pretty. 17% of parents say they appealed to the SEND Tribunal against their local authority’s decision on their child’s education. The report includes a series of recommendations to Government and local authorities aimed at reducing delays in getting support and making sure every area has the right mix of schools and other educational provision. The Government must make sure the new system can work effectively, eliminate delays in accessing support and ensure families get help to challenge the system, when needed. Central and local government, as well as multi- academy trusts, must work together to make sure the right mix of educational provision and support for autistic children is available locally. Training and awareness of autism must be embedded across the education system. This report is part of the joint Every Child campaign, led by The National Autistic Society and Ambitious About Autism. Read it on the NAS site here. We've covered the reforms since before the Green paper and have watched this unfurl like a slow-motion car crash. We haven't just stood by and observed, Angela and I were actively involved with the Surrey Pathfinder as part of our local parent carer forum and I have been involved as a parent voice since. The NAS survey illustrates a disturbing picture, especially when you consider that half a BILLION pounds has been spent on these reforms so far. It's starting to look (well, let's be honest, it was always on the cards) like a botch job. 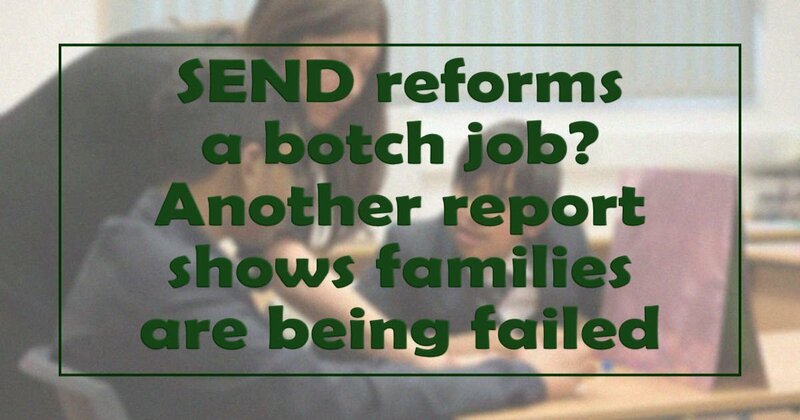 Although the reforms were designed to cut the number of families who felt forced to take the stressful route to the SEND Tribunal, this report shows that this has not been the case. Although 2015 figures did show a reduction in cases getting to the Tribunal, this is more likely to be because of the length of time it has been taking for EHCPs to be processed, with families reporting to us that their initial applications have sometimes not been responded to for weeks, so that LAs don’t have to register it and trigger the 20 week deadline. My own sons’ transfers to EHCPs took 11 and 10 months. The DfE itself is carrying out a survey on parent experience of EHCPs processed in 2015 and this includes one of my sons, although I haven’t received a survey invitation. Meanwhile on our Facebook page, a parent reported that a friend of hers had been sent a survey and they didn’t even have an EHCP! This is possibly, or probably, because of incorrect information sent to the DfE by local authorities. The report pointed to Ministry of Justice figures show that autism is the most common type of need identified in SEND Tribunal cases, making up 35% of all Tribunal appeals in 2014-15. We covered this when the figures first came out. The same figures show that three-quarters of appeals were subsequently withdrawn or conceded by local authorities, and of those that proceeded to a decision, 86% found in favour of the parent. The National Autistic Society says this suggests too many wrong decisions are being made by local authorities, and parents are right to believe that the system does not always work in their child’s interests. There has been a trial going on with the Tribunal, handling more appeals by telephone case management and dealing with health and social care disagreements where at present, there are separate routes for redress for these. I believe this will work much better, preventing LAs from dragging families as far as the court itself. The state of things here sadly just seems to echo the state of things in the country as a whole: chaotic, ill-thought through policies that are launched on a wing and a prayer before worst-case scenarios are considered and plans put in place to make sure they don't happen. It amounts to playing with the futures of the children who need the most protection. It makes me want to scream. Time and again the government was warned about pushing things too fast without sufficient thought. Little tweaks were made in response to interventions from charities such as IPSEA and even from things we wrote, I believe. However, too many egos and too much power was at stake to allow the brakes to be put on. Yes, parents were offered the chance to 'have their say' and co-production was once a big thing, at least at the beginning although not everywhere. But the bigger picture was missed time and again (or ignored): government makes rules but PEOPLE carry them out. People are not robots driven by computer programs to carry out orders. You have to take them with you, not just dictate what will happen. Then, as now, local authorities and the NHS have too many staff who STILL just don't 'get it'. They don't understand what it's like to be a parent constantly at breaking point, mired in worry about their child's future as well as perhaps dealing with behavioural or physical difficulties, money worries, sometimes even relationship issues or older parents of their own. And then they are faced with a local authority that seems to actively be trying to make things more difficult when the government has promised it will be better. I know good people working very, very hard in LAs to make things better. I know they tear their hair out at the intransigent attitudes they are met with from colleagues in SEND departments, health and social care. I know that changes are being made in response to justified criticisms and that it takes time to filter through. I worry that they are not concentrating on all the right areas, especially culture change. But let's not forget those people and services are stretched to breaking point too. Health services are strapped for cash and staff, while one after another LA Children's Services departments seems to get an inadequate rating from Ofsted. Talking of Ofsted, the SEND inspections they lead along with the CQC are starting to report back, but so far, the (public) reports published seem completely to be lacking specificity or targets. We'll be following up on this so if you have views to share please send them in. We reported recently on the new changes to Initial Teacher Training (ITT), designed to put autism at the heart of the curriculum for new teachers. But what about speech and language? –now there's a petition to improve that training for teachers. If the government wants every teacher to be a teacher of children with send then they need to be trained to do that. It won't be to the detriment of children without SEND. They will also benefit from better trained teachers who are also able to cope with the class's autistic child(ren). But what about existing teachers and school leaders? I'm not talking about the innovative, inclusive talented teachers in forward-thinking schools. We all know the ones I'm talking about. There are children in classrooms every day who are excluded, poorly taught, placed in inappropriate seclusion because these schools and teachers don't have the expertise they need. Who will ensure that they are given the opportunity to acquire it? And while we're about it, why should a new SENCo have three years before they need to have a SENCo qualification? Shouldn't they train for these qualifications before they take up a role? Aren't our children worth this? Or is the SENCo role such a poisoned chalice that it's hard to believe anyone actively wanting to be one? I know a number of people, including members of the SNJ wider team who are involved in training LA staff and they are not finding it easy, for any number of reasons be they structural, political, financial or personnel. But they are the ones who are trying, at least. I am involved in helping our own LA's Local Offer and offer Working with Parents training for professionals. Working with SEND parents needs a SEND parent to teach it, who knows what they're talking about and has solutions to offer. Our director, Barney (@AspieDeLaZouch) , an experienced former SENCo, offers many different kinds of training, so if you're thinking of this as a professional, get in touch soon before he is totally booked up. Renata can tell you how parent carers with children with health needs would like to be treated, because she is one. The reforms started off as a jolly good idea. Parents were consulted. A revolutionary green paper was launched. The White paper significantly downgraded the aspirations of the Green paper. Parents voices were heard, then became subsumed by what worked best for everyone else. The SEND Code of Practice left far, far too much open for interpretation by people in LAs who put their own self-interest first. The DfE inexplicably thought that the expertise - and the will - already existed to make the changes work for the good of the child. Implementation began before the pathfinder trials as were over and the learning had been learned. Political expediency triumphed over children's needs. I was told Michael Gove, the then Education Secretary said that the steam train (of SEND reform) wasn't stopping for anything. An election loomed. There was no time to pause the journey and ponder if where they were headed was where they set out to end up. It's not too late. We await the results of the DfE survey and the Lee Scott report and see what will happen as a result. The problem is clear, as are the solutions. The DfE need to stop pretending the issues are just teething troubles - we are TWO years in - and everything is heading in the right direction. In some areas, that may be so, but it's not fast enough. We need to put politics and self-interest aside once and for all for the sake of our children. Read about our proposed SEND Code of Conduct campaign - an update coming soon! Following the NAS report, the Department for Education have issued a statement along with further information, which I'm pasting below in full for your information. “We have made changes to the system of support for special educational needs and disability (SEND) which put families and children at their heart, making it less adversarial for them - and we are seeing good progress. We are seeing some very positive results in feedback from parents and young people where the new system is working well – a small-scale pilot survey of families with EHC plans in 2014 found that 67% agreed that their EHC plan led to the child or young person getting the help and support they need, 62% agreed their plan improved the child or young person’s experience of education and 50% agreed their plan improved the child or young person’s health or wellbeing. We are reviewing the system of Disagreement Resolution, which includes mediation and tribunals, to make sure that it works effectively for parents and carers. This honours a commitment in the Children and Families Act 2014 and will report back next year. Of 1,400 mediation cases held in 2015, more than 75% (1,055) were resolved without the need to appeal to the Tribunal in 2015. A review of Initial Teacher Training (ITT) by Stephen Munday earlier this year, SEND training will now form part of the new core content for the training of all teachers. In 2016-17, the Department for Education is funding the Autism Education Trust (AET) to provide autism training at three levels for staff in early years, schools and colleges. To date the AET has trained more than 100,000 education staff. The contract with the AET also covers funding for an exclusions advice service, run by the National Autistic Society (NAS), which offers advice to parents and educational professionals about how to prevent the exclusion of pupils with autism and what to do when a pupil has been excluded. We publish a wide range of statistics on pupils with SEN, at national and local level including information on educational attainment, exclusions, absences and timeliness of EHC plans and progress converting statements to plans and research into families and young people’s experience of the new system. An online SEND report enabling users to compare LA performance against other LAs and nationally is publicly available. More than 74,000 young people with SEND now have EHC Plans. These are important changes to the system and we continue to work closely with councils to ensure they meet the requirements placed on them. From May 2016, Ofsted and the Care Quality Commission (CQC) began inspecting local areas on their effectiveness in fulfilling their new duties for children and young people who have special educational needs or a disability (SEND). All 152 local areas in England will be inspected over a period of five years. The inspections will consider how effectively the local area identifies, meets the needs and improves the outcomes of the wide range of different groups of children and young people who have special educational needs or a disability. Andrea, you need to get in touch with Contact a Family, your local IASS, IPSEA or SOSSEN for direct help.